Dine on-board the iconic wheel! Collyer Quay, The Fullerton, Esplanade Theatres, Merlion Park, the F1 Circuit, Helix Bridge, Marina Bay Sands…count the landmarks you can spot from 165m above ground! Check out two of Klook's special bundles - Singapore Flyer Flight & Gardens by the Bay and Singapore Flyer Flight & Universal Studios Singapore™ for your visit to Singapore! Overall experience is quite enjoyable and relax. For the choice of ribeye steak, the starter and appetiser is just normal, nothing much to comment. But for the ribeye steak, it cook well, taste great but too salty. For thyme-baked fish fillet with ee-fu noodle, the starter and appetiser are both taste great and portion for the appetiser is quite a lot. But, the main course is dissapointing, nothing special or to be impress. Lastly, the dessert serve in the end is consider taste just normal too, pudding with coconut and gula melaka on top of it. At the end, will have the choice of coffee/tea as well, we choose tea, both tea is tasteless, added 1 pack of sugar to improve the flavour. Viewing inside the flyer was awesome, but have to share with at least 3 group of people. Savor an exquisite, four-course dinner experience aboard the city's famed wheel. 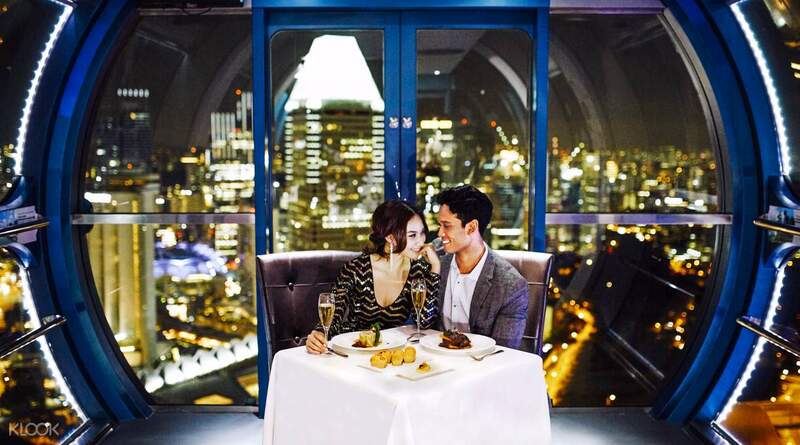 Whether with a loved one or family, it's guaranteed to be a memorable meal on the Singapore Flyer as you soar above breathtaking views of the metropolis. Enjoy an hour of delicious food and drinks complete with full butler service, alongside iconic landmarks such as Collyer Quay and Esplanade Theatre, Helix Bridge and Marina Bay Sands. 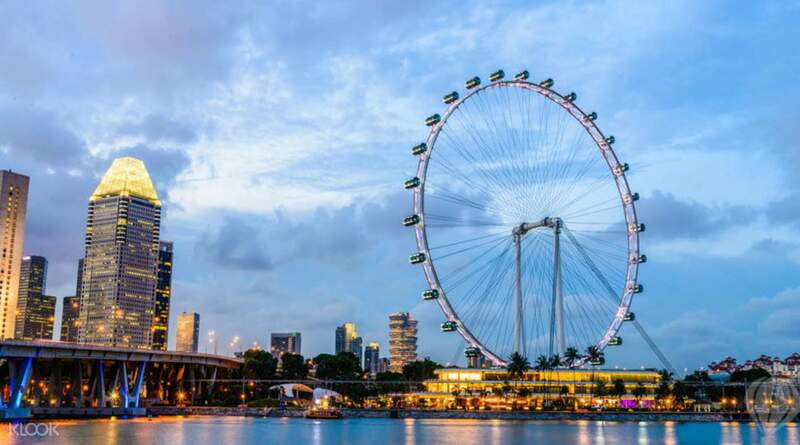 The world's largest giant observation wheel in Asia runs some half an hour for every rotation, with the highest point at 165m from the ground - serving you the most expansive and inclusive views of the city! 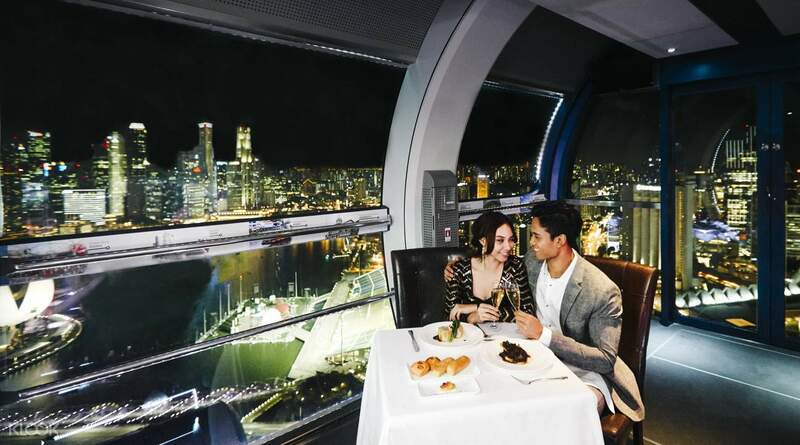 Singapore Flyer Dining experience will be an unforgettable romantic night out! Overall experience is quite enjoyable and relax. For the choice of ribeye steak, the starter and appetiser is just normal, nothing much to comment. But for the ribeye steak, it cook well, taste great but too salty. For thyme-baked fish fillet with ee-fu noodle, the starter and appetiser are both taste great and portion for the appetiser is quite a lot. But, the main course is dissapointing, nothing special or to be impress. Lastly, the dessert serve in the end is consider taste just normal too, pudding with coconut and gula melaka on top of it. At the end, will have the choice of coffee/tea as well, we choose tea, both tea is tasteless, added 1 pack of sugar to improve the flavour. Viewing inside the flyer was awesome, but have to share with at least 3 group of people. Overall experience is quite enjoyable and relax. For the choice of ribeye steak, the starter and appetiser is just normal, nothing much to comment. But for the ribeye steak, it cook well, taste great but too salty. For thyme-baked fish fillet with ee-fu noodle, the starter and appetiser are both taste great and portion for the appetiser is quite a lot. But, the main course is dissapointing, nothing special or to be impress. Lastly, the dessert serve in the end is consider taste just normal too, pudding with coconut and gula melaka on top of it. At the end, will have the choice of coffee/tea as well, we choose tea, both tea is tasteless, added 1 pack of sugar to improve the flavour. Viewing inside the flyer was awesome, but have to share with at least 3 group of people. Fabulous experience! Getting into the flyer was easy and hassle-free, as you are escorted to the priority line so no queue at all! Plus the night we booked, we have the entire capsule to ourselves, so it was very relaxing and private. The staff are courteous, helpful and friendly, and our host that time was very nice to even take our pictures. Food was good, and I was pleasantly surprised that the serving is bigger than I expected! Also the view was superb and two rotations give you enough time to appreciate the view while leisurely dining! Drinks are separately purchased though and quite pricey. Overall I would highly recommend this activity! Fabulous experience! Getting into the flyer was easy and hassle-free, as you are escorted to the priority line so no queue at all! Plus the night we booked, we have the entire capsule to ourselves, so it was very relaxing and private. The staff are courteous, helpful and friendly, and our host that time was very nice to even take our pictures. Food was good, and I was pleasantly surprised that the serving is bigger than I expected! Also the view was superb and two rotations give you enough time to appreciate the view while leisurely dining! Drinks are separately purchased though and quite pricey. Overall I would highly recommend this activity! It was amazing experience❤️ I took a lot of pics and had fun with my husband! Hope everyone who visits SG has the most beautiful time with this like me! It was amazing experience❤️ I took a lot of pics and had fun with my husband! Hope everyone who visits SG has the most beautiful time with this like me! Excellent service! You pay for what you get and we really enjoyed it. I would definitely come back again if there’s a chance! Excellent service! You pay for what you get and we really enjoyed it. I would definitely come back again if there’s a chance! The appetizers were kind of "meh" but the steak and dessert were tasty. The servers were very professional and attentive. The views of the city were spectacular! Great experience overall. The appetizers were kind of "meh" but the steak and dessert were tasty. The servers were very professional and attentive. The views of the city were spectacular! Great experience overall. A bit confusing at first not knowing where to go. The confirmation did not specify to go to check in at the lounge which is NOT the ticketing booth. Having said that. OMG! Definitely a MUST DO in Singapore. Food was superb, atmosphere was perfect and the view-breathtakingly beautiful. It was so memorable. A bit confusing at first not knowing where to go. The confirmation did not specify to go to check in at the lounge which is NOT the ticketing booth. Having said that. OMG! Definitely a MUST DO in Singapore. Food was superb, atmosphere was perfect and the view-breathtakingly beautiful. It was so memorable. Thankyou Klook for become our best night moments. I'm so in love with the view, besides, we also enjoy the dinner so well. Recommended so much for the Western Beef food. It so good ???????? I would love to book again on the upcoming event through klook, you will really love this app definitely since they sell the voucher here more cheaper... Thanks Klook! Thankyou Klook for become our best night moments. I'm so in love with the view, besides, we also enjoy the dinner so well. Recommended so much for the Western Beef food. It so good 👌🏻 I would love to book again on the upcoming event through klook, you will really love this app definitely since they sell the voucher here more cheaper... Thanks Klook! 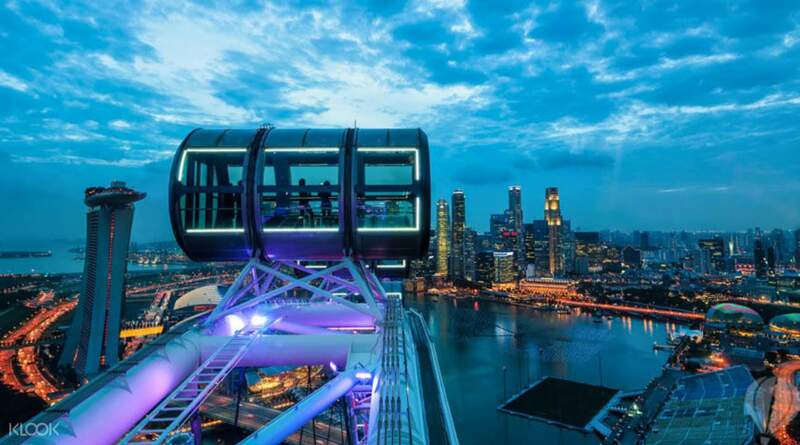 Two circuits in the Singapore Flyer, plus a five course meal - appetizer, soup, entree, main, dessert plus a drink and coffee afterwards. The cost was roughly the same as you would pay in a Brisbane restaurant, with the added attraction of great views of the lights of Singapore. Two circuits in the Singapore Flyer, plus a five course meal - appetizer, soup, entree, main, dessert plus a drink and coffee afterwards. The cost was roughly the same as you would pay in a Brisbane restaurant, with the added attraction of great views of the lights of Singapore. my husband booked us for dinner at the singapore flyer as birthday and honeymoon present. i thought we would be in a restaurant up on a tower or something, because silly, simpleton me didn't know what singapore flyer was. i was in for a big surprise. I am looking for the way up was a puzzler to us. thankfully, we found the way to the elevator leading to the lounge just in time. we were greeted by the friendly staff and guided to the flyer itself. we declined the butler service, but were surprised to be alone in the cable car. i mean, it was a huge car, and all to ourselves. i was very excited and giddy. the food i think was good, but i can hardly remember it because of all the excitement. i saw all the buildings of singapore, the marina bay sands and the marina bay. i mean, the view was spectacular, and it was my first time in singapore. it was very amazing. we went for 2 rounds, very awesome. we took lots of pictures of ourselves (timer and a lot of difficult places for the camera). but other people also took lots of pictures of us coz we were the only ones having dinner. we felt like movie stars, bwahahahaha!!! my husband booked us for dinner at the singapore flyer as birthday and honeymoon present. i thought we would be in a restaurant up on a tower or something, because silly, simpleton me didn't know what singapore flyer was. i was in for a big surprise. I am looking for the way up was a puzzler to us. thankfully, we found the way to the elevator leading to the lounge just in time. we were greeted by the friendly staff and guided to the flyer itself. we declined the butler service, but were surprised to be alone in the cable car. i mean, it was a huge car, and all to ourselves. i was very excited and giddy. the food i think was good, but i can hardly remember it because of all the excitement. i saw all the buildings of singapore, the marina bay sands and the marina bay. i mean, the view was spectacular, and it was my first time in singapore. it was very amazing. we went for 2 rounds, very awesome. we took lots of pictures of ourselves (timer and a lot of difficult places for the camera). but other people also took lots of pictures of us coz we were the only ones having dinner. we felt like movie stars, bwahahahaha!! !